Is an iggy the right breed for you? IGs are notoriously hard to housetrain, and even the best-trained IG may occasionally have an accident, especially in cold or wet weather. It takes diligence, a schedule, confinement, appropriate clean-up of accidents, and patience to housetrain an IG. Confining an IG is essential for successful housetraining, but should not be abused. An IG should not be expected to stay in a crate or kennel for eight to 10 hours a day. If you use a kennel/crate while you're gone, it's best to hire a dog walker to come in midway through the day to take the dog outside if you'll be gone more than six hours, or use an alternative such as litterbox training or dog daycare. Many dogs are successful with paper training/potty pads or a litter box inside of an exercise pen, a giant-sized crate (dog bed in the front, potty pad in the back), or a designated dog room. Many IGs can be successfully trained to use a litter box with little effort. Use an oversized plastic tray lined with newspaper. For males who like to lift thier legs use a large plastic storage box with a door way cut out of one end. Be sure to file down the edges of the doorway so they wont injure your IG. Again line this box with newspaper. 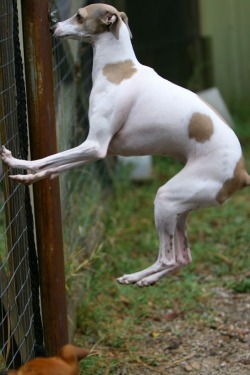 Italian Greyhounds are not miniature greyhounds and do not have activity levels similar to retired racing greyhounds. Most young IGs (under 5 years) are very active and require daily walking along with off-leash playtime in a safely fenced area. This is, for the most part, not a laid-back toy breed. IGs, especially young ones, can be very active in the house. They like to run, jump off furniture and roughhouse with other animals. They're not a breed to have if you don't want pets on your furniture or bed, or if you like to display expensive collections on low tables or open shelves. Italian Greyhounds need a lot of stimulation. They need to be physically and mentally fit, which includes scheduled exercise, free playtime in a safe, fenced environment and training classes. All dogs can benefit from at least one six to nine week class session of basic obedience, and many will go on to complete more obedience classes. IGs with a high prey drive may enjoy lure coursing. Many IGs make excellent walking or jogging partners, but may want to stay home in cold or wet weather.IGs should never be off lead in any area that's not safely fenced. They are sighthounds, and even the best trained IG may take off after a rabbit, bird, or piece of paper blowing in the wind and meet a tragic end, either by becoming lost, or killed by traffic or a predator. Invisible fencing is not recommended because: it does not keep other dogs out of your yard, the batteries in the collar may malfunction, and an excited IG may run through the fence, then become frightened of the shock and keep on running. Senior IGs (10+ years) will more readily adapt to a life of leisure, and may be better suited companions for someone who does not want the additional responsibility of an active, younger dog. But, even older dogs will gain weight and lose muscle tone if they are not given enough exercise. Short walks, several times a day, may be the answer. IGs often live to be 14 - 17+ years, so your companion will probably be around a long time. Leg breaks are common in IGs, these are very expensive and time consuming to fix. An IGs fine build combined with their love of jumping and running can spell disaster. The most common age for leg breaks is between 4 - 12 months of age. Young IGs are fearless climbers and will leap from any height they can climb to. Many IGs cannot be placed in homes with very young children who might drop or step on them, or with large dogs. IGs do not realise their small size and are often hurt inadvertently by bigger dogs stepping on them. If an IG is going to a home with larger dogs it is essential they are kept in a separate area from the larger dogs to ensure their safety. In short, an IG is a fabulous pet for the right type of family, and a disaster in the wrong type of family. Many of us find this athletic, elegant breed to be excellent companions!